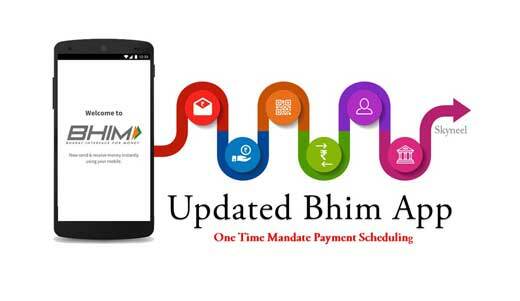 Recently Bhim app updated added one time mandate payment scheduling feature know how to schedule payment on bhim app as per your need. In this article we have to discuss how could you use updated Bhim app one time mandate payment scheduling feature at your smartphone. Bharat Interface for Money is a mobile app developed by National Payments Corporation of India, based on the Unified Payment Interface. Bhim app was launched by Prime Minister Shri Narendra Modiji. BHIM stands for Bharat Interface for Money. It is a mobile application developed by NPCI. NPCI stands for National Payments Corporation of India, built on the Unified Payment Interface (UPI). The main advantage of using BHIM App is that you don’t have to remember the banking details. The updated Bhim app added a new feature for one time mandate payment scheduling. With this new feature, users can easily schedule their payments later on any date. At present cashless payment system increased in the India. UPI is one of the main app which is used for received, send money, check balance, scan a QR code to make a payment without sharing a phone number. UPI transactions has been increased in 2018. The NPCI was also working on the updated version of BHIM app and now a new feature of the new BHIM version has started to appear. In August 2018, NPCI had announced UPI 2.0, in which changes like Overdraft Account, One-time Mandate, Promotion of Transaction Limit features also added. Now NPCI has recently added one new feature with the name of One-Time Mandate in the latest version of the BHIM app. With this latest feature, users can easily schedule their payments later on any date. For example if you want to pay your monthly post paid bill on the 10th of the month, you can schedule your mobile bill for that date anytime before the 15th date. Once payment schedule is saved, it will remain in your account, but you will be blocked till payment. The good thing is that you will not stop getting the interest of those money. This app currently allows his users to peer-to peer UPI mandate. Step 1: Open the BHIM app at your smartphone and enter 4-digit passcode for login. You will get four tabs, including My Mandates, Create, Scan and Gift options. If you already create any mandate then you can check your own create mandate in My mandate option. With the help of scan option will allow to scan the receiver’s QR code and make the mandate. Step 2: Now tap on the Create option in which you will get included UPI Mandate. After that you will get a list of the recent receivers, which you have already sent money to. Either you can choose from list of recent receivers or also add new UPI IDs. Step 3: Now enter the amount you want to schedule and tap on the Next button. After that this app will ask you for its frequency. By default it is set on “one-time”. Step 4: Tap on the “validity” option and set remark if you need to know why payment has been done. Now after tapping on “Proceed”, you will find all the information about your scheduling. Now you have to verify the information once and confirm the same. It will ask for the UPI pin code, when PIN is verified, your payment schedule will be blocked till the date and its notifications will be available to the receiver. After accepting receiver’s request, the amount will be reached in his account.